..is lifeless. But that’s not a turn-off. At least not for everybody. At this ungodly hour, you can have Club Street’s dainty rows of higgledy-piggledy shophouses all to yourself. Empty five foot ways, deserted barstools and straight uninterrupted views all around make for perfect sketching conditions except for the ginormous supply trucks that come by to stock up the watering holes and restaurants so they can wine and dine every last one of their evening revellers. Now whether these hulks will park in front of the very subject you selected after prolonged scouting will depend on the alignment of your stars. Mine were in perfect constellation. None of the trucks blocked my line of vision. From the barstool of ‘Ninety Four’ I enjoyed unhindered views of Ann Siang Hill. Plus the man in front, resting on the stool, kept fairly still and stayed long enough for me to include him in the scene. Also none of the cars drove off mid-sketch, which is rare. Now if only the bar would open and I could get a drink..wait..it did! 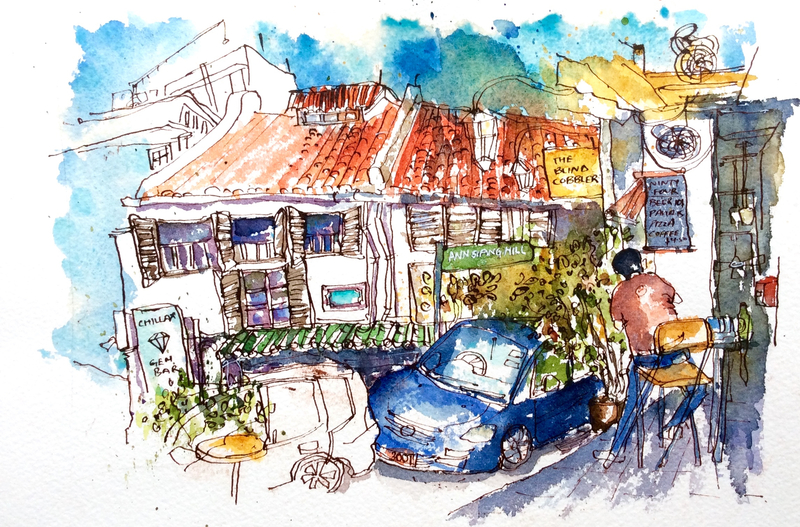 This entry was posted in Daily Vignettes and tagged Ann Siang Hill, Club Street, drawing, illustration, Ninety Four, Singapore, sketching, urban sketching on June 23, 2015 by Somali Roy.